Robert Motherwell was an American painter, printmaker and editor. He was one of the youngest of the New York School (a phrase he coined), which also included Jackson Pollock, Mark Rothko, Willem de Kooning, and Philip Guston. Robert Motherwell was born in Aberdeen, Washington on January 24, 1915, the first child of Robert Burns Motherwell II and Margaret Hogan Motherwell. The family later moved to San Francisco, where Motherwell's father served as president of Wells Fargo Bank. Due to the artist's asthmatic condition, Motherwell was reared largely on the Pacific Coast and spent most of his school years in California. There he developed a love for the broad spaces and bright colours that later emerged as essential characteristics of his abstract paintings (ultramarine blue of the sky and ochre yellow of Californian hills). His later concern with themes of mortality can likewise be traced to his frail health as a child. Between 1932 and 1937, Motherwell briefly studied painting at California School of Fine Arts, San Francisco and received a BA in philosophy from Stanford University. At Stanford Motherwell was introduced to modernism through his extensive reading of symbolist and other literature, especially Mallarmé, James Joyce, Edgar Allan Poe, and Octavio Paz. This passion stayed with Motherwell for the rest of his life and became a major theme of his later paintings and drawings. At the age of 20 Motherwell traveled to Europe with his father and sister. They made a Grand Tour starting in Paris, then went to Amalfi, Italy; Switzerland; Germany; The Netherlands; and London; and ended in Motherwell, Scotland. From Motherwell's own words, the reason he went to Harvard was that he wanted to be a painter, while his father urged him to pursue a more secure career: "And finally after months of really a cold war he made a very generous agreement with me that if I would get a Ph.D. so that I would be equipped to teach in a college as an economic insurance, he would give me fifty dollars a week for the rest of my life to do whatever I wanted to do on the assumption that with fifty dollars I could not starve but it would be no inducement to last. So with that agreed on Harvard then—it was actually the last year—Harvard still had the best philosophy school in the world. And since I had taken my degree at Stanford in philosophy, and since he didn't care what the Ph.D. was in, I went on to Harvard." At Harvard, Motherwell studied under Arthur Oncken Lovejoy and David Wite Prall; to research the writings of Eugène Delacroix he spent a year in Paris, where he met an American composer Arthur Berger. In fact, it was Berger who advised Motherwell to continue his education at Columbia University, under Meyer Shapiro. In 1940, Motherwell moved to New York to study at Columbia University, where he was encouraged by Meyer Schapiro to devote himself to painting rather than scholarship. 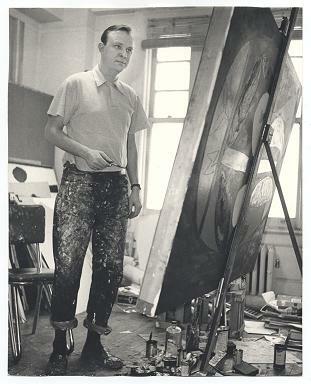 Shapiro introduced the young artist to a group of exiled Parisian Surrealists (Max Ernst, Duchamp, Masson) and arranged for Motherwell to study with Kurt Seligmann. The time that Motherwell spent with the Surrealists proved to be influential to his artistic process. After a 1941 voyage with Roberto Matta to Mexico—on a boat where he met Maria, an actress and his future wife—Motherwell decided to make painting his primary vocation. The sketches Motherwell made in Mexico later evolved into his first important paintings, such as Little Spanish Prison (1941), and Pancho Villa, Dead and Alive (1943), both in the MoMA collection). Artworks of Robert Motherwell are removed from WikiArt due to a copyright infringement notice.